It wasn’t a bottle of white wine, although in hindsight it’s obvious that cold vino would have been the way to go. 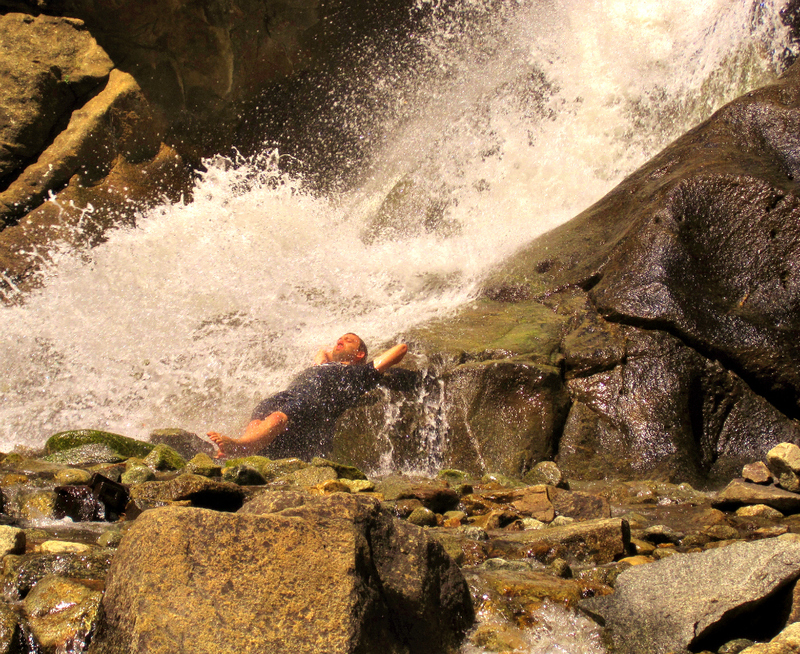 A man refreshes at Boulder Falls. Anyone who has read The Sun Also Rises will understand what I mean when I say I “went Hemingway” on the creek, wedging my water bottle between two rocks, allowing the cold water to do its thing. It was early afternoon and quite hot in the sun – approaching 90 degrees – and as the adrenaline from the morning climb wore off I began to feel my tired muscles. Having learned my lesson hiking to 14,000 feet earlier in the week, I passed on an afternoon cocktail for a healthy serving of hydration. Looking back that decision seems foolish now, given the calming scenery and how good the sips of wine would have tasted in the heat of the day. 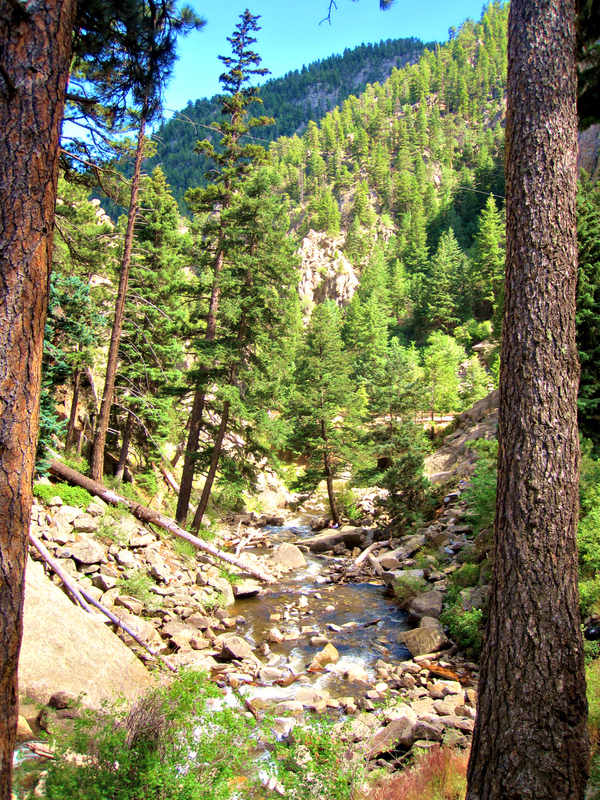 As if sitting on the side of the creek and hearing the water flow wasn’t enough, the canyon walls, pine trees, blue sky, and cascading waterfall wrapped everyone up in an afternoon comfort. 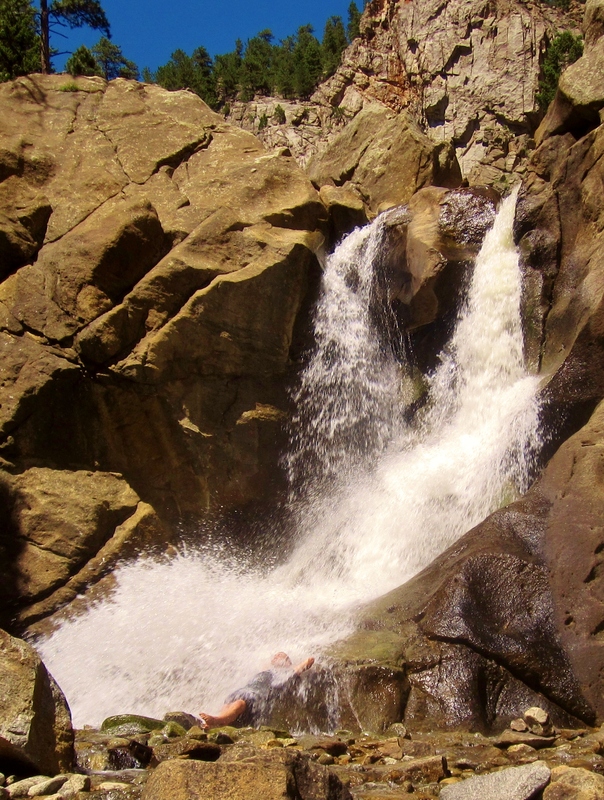 People gathered at the base of the falls, sitting and walking with their ankles in the water, the dogs jumping into the deeper pools. Some had brought picnics, others hammocks and chairs. That morning I had climbed about 1000 ft to the top of the first flatiron, and needless to say my toes were a bit rough from the journey, from being stuffed into the purposely cozy climbing shoes (reason being a big shoe wouldn’t fit in a small hole in the rockface). When I held my feet in the running water and spread my toes, the force of the current performing a makeshift massage, I felt like rehabilitation – both in mind and body – had begun. One man took it a step further, as you’ll see from the photos below. 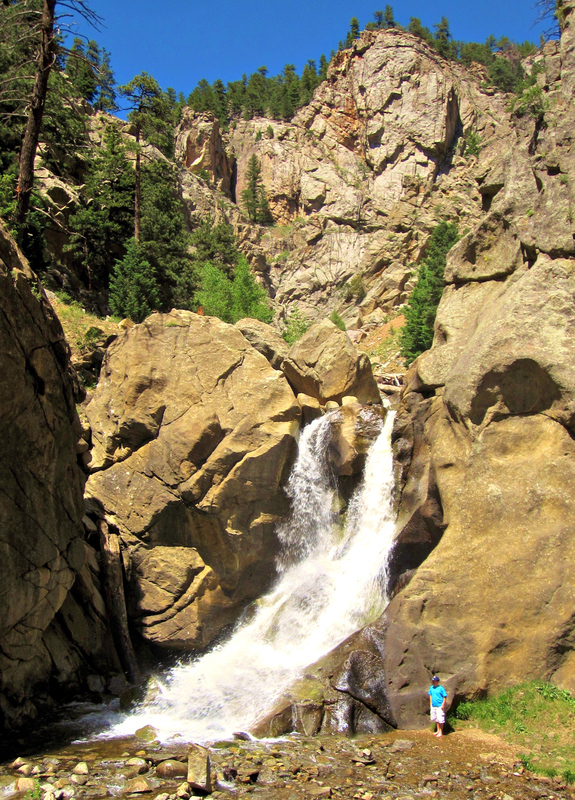 Boulder Falls is located about 12 miles from the cabins of Chautauqua Park (trail open May 1 – October 31), a beautiful drive along the winding road into the Rockies. 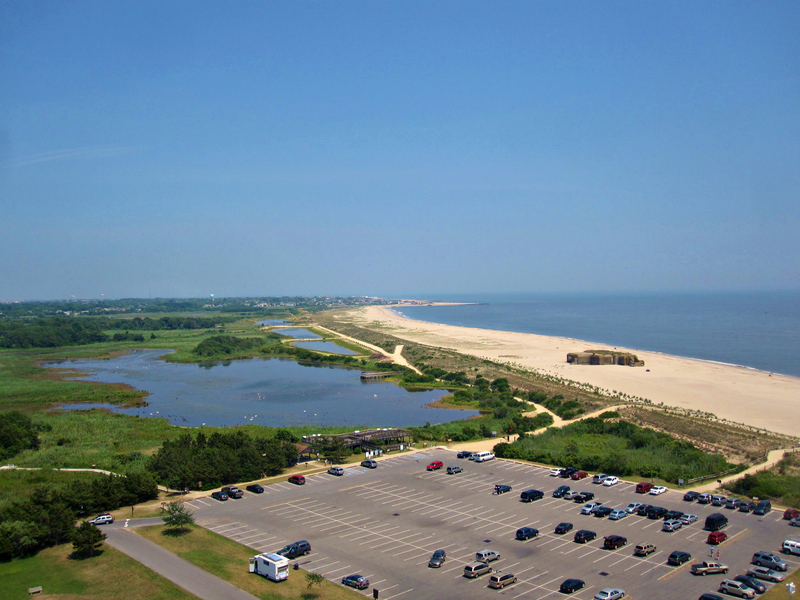 It’s less than a five-minute walk from the road, making it the perfect outdoor sanctuary for people who want to feel good about doing absolutely nothing. My advice would be to bring some friends, and wash down the afternoon with a cold drink. 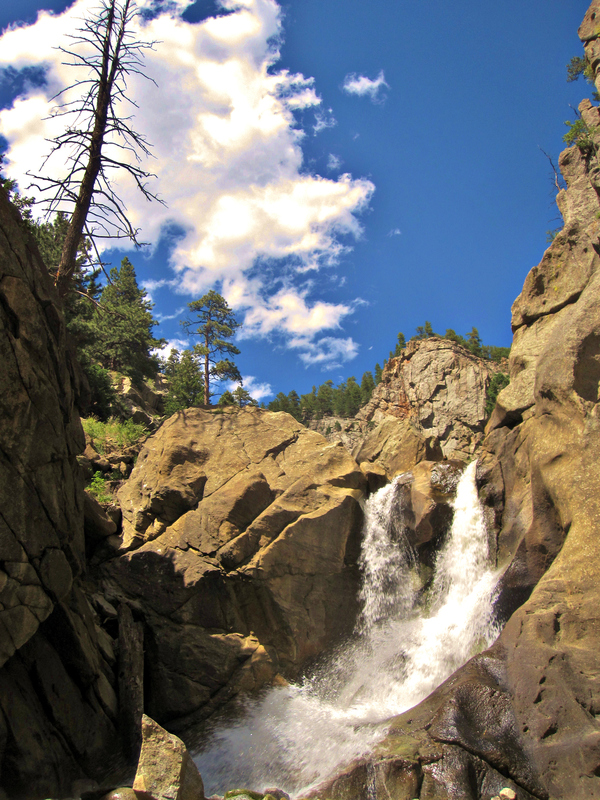 Cooling off at Boulder Falls.